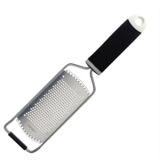 Stainless steel nutmeg grater. Freshly ground nutmeg is the key to a strong yet delicately spicy flavour. Once ground, the distinct flavour of nutmeg starts to quickly dissipate and you need to use a lot more for food or drink to get the flavour to come through. So, grating fresh nutmeg onto a cocktail like an Alexander allows you to add just a little fresh nutmeg which adds theatre to the act of garnishing the cocktail. Not only will ground nutmeg improve the flavour of your cocktail, it will also mean you can use less. Grind nutmeg to order for the best flavour. The act of grinding nutmeg adds theatre to your table service. Not only will ground nutmeg improve the flavour of your cocktail, it will also mean you can use less. Has hole for wall hanging when not in use.